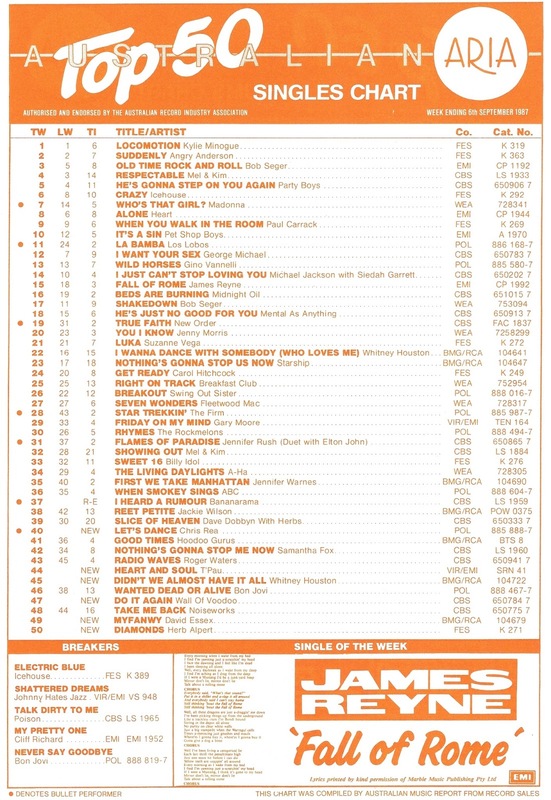 I don't know what was going on this week in 1987, but if the week's ARIA chart new entries are anything to judge by, every senior citizen in the country must have rushed to their local record store and bought up big. As we'll see, most of the top 50 debuts and the one breaker I'll feature had some sort of blue rinse appeal. In 1987, buying music was still very much a cross-generational thing. Although CDs were starting to increase their market share, vinyl and casettes were still selling strongly - meaning it didn't matter how old you were, there was still a format you'd be familiar with at your local record store. Meanwhile, at number 1 this week in 1987 was a song with very strong youth appeal. Neighbours star Kylie Minogue held on to the top spot for a fourth week with "Locomotion". The Canadian a cappella group landed a big US hit with their version of Steam's "Na Na Hey Hey Kiss Him Goodbye" (number 22 here in 1970), a song most recently taken into the top 40 by Bananarama in 1983. This lead single from third album One Way Home had the "All You Zombies" about it, but while that track had been one of The Hooters' two ARIA top 10 hits, "Johnny B" didn't fare so well. Second album time for the British band, but while their chart fortunes declined in the UK and Australia, lead single "Motortown" was their first US top 40 single. The song reached its local peak upon re-entry in early 1988. This should've been massive - the powerful voice of Laura Branigan teamed with the production skills of Stock Aitken Waterman, but this remake of a little-known 1980 song by Ellie Warren failed to live up to its potential. The second most successful Astley to release music in 1987, Jon started out as a producer in the 1970s before launching his performing career with this quirky pop track. More electro-tinged rockabilly to follow "Sonic Boom Boy", but just not as good. Apparently, that's Massive Attack's 3D and Goldie painting the mural in the background of the video. The debut single would end up re-recorded and re-released, becoming their first UK top 40 hit in early 1988. In Australia, the Scottish band had to wait until early 1989 for success. This more sedate follow-up to the frenetic "Why Can't I Be You?" had an appropriately less flashy chart run, despite the fact that it was another fantastic single. A slight improvement on the peak of "Distraction" for this single by the Australian synthpop band. "Power" also featured on the Horrorbox EP, which reached number 95 on the albums chart. This was the lead single from Always Guaranteed, Cliff's first studio album in a number of years, and although it missed the top 50, the follow-up, "Some People", would be a much bigger hit in the coming months. But, at 47 years of age, Cliff's days as a relevant artist were numbered, with his squeaky clean brand of pop losing favour in Australia. He'd keep scoring hits in the UK for a few more years, but after 1987, we'd only see him on the Australian top 50 on two more occasions: Christmas 1988 and 1999. Legendary trumpeter and band leader Herb Alpert is five years older than Cliff Richard (so, he was 52 years old in 1987), but this track from his Keep Your Eye On Me album was given a dose of cool by featuring the vocals of Janet Jackson and the production skills of Jimmy Jam & Terry Lewis. Despite the fact that "Diamonds" had the potential to appeal to two generations, it didn't do so well in Australia - but was a massive hit in the States. The full video (the song doesn't get going for a couple of minutes) is below, a link to an edited clip is in the song title. He was a teen sensation in the '70s, with massive singles like "Rock On" and "Hold Me Close", but by 1987, 40-year-old David Essex was struggling to spark much interest beyond his faithful fans, with this dreary little ditty just scraping in to the top 40. The lyrics were from a poem written by John Betjeman about his friend, Myfanwy Piper, who had been a regular collaborator of composer Benjamin Britten's - but just try to get to the end of the clip without nodding off. A band who surfaced every now and again to score a minor hit, Wall Of Voodoo had previously charted in 1983 with "Mexican Radio" and in 1986 with "Far Side Of Crazy", even though the line-up on both tracks was quite different. For their latest offering, the newer incarnation of the band tackled the 1968 Beach Boys classic and gave it a modern twist. Like the Herb Alpert song, the potential for cross-generational appeal was there, but it failed to capitalise on that. At home in America, this was another in her record-breaking streak of number 1 singles, but the follow-up to "I Wanna Dance With Somebody (Who Loves Me)" was a relative flop in Australia. Two possible reasons why the big ballad (which would've appealed more to older fans) failed to go any higher are that most people had the Whitney album by now and this track did not have a music video. Instead a live clip was used, and it's one of those performances where Whitney does that annoying thing of not keeping in time with the music - holding on some words as long as she can before rushing to catch up for the end of sentences. Give me the album version any day. The only track that didn't have some link to an older demographic is this new entry by the British group led by Carol Decker. Named after a Star Trek character, T'Pau would only score this one top 50 hit in Australia, but in the UK, they'd have several more, including number 1 smash "China In Your Hand". I loved "Heart And Soul" and it's part-spoken, part-sung arrangement, but many of the group's other songs tended towards a more predictable pop/rock sound, so "China In Your Hand" aside, Australia didn't miss out on too much. 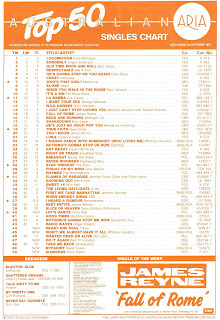 Chris might have only been 36 at the time this future top 10 hit charted, but he sounded much older, and "Let's Dance" was definitely middle-of-the-road pop/rock at its best. It's another song I liked in 1987, but may well have turned my nose up at a few years later when I started to realise that just because something was in the top 50, didn't mean I needed to like it. Next week: new songs from two of the biggest bands of the year. Before that, I'll be counting down my favourite singles and albums by Pet Shop Boys to coincide with the release of their latest studio album, Elysium. That's a very 80s picture sleeve used as an image for the Nylons video. The Hooters song seems familiar, though I'm not sure I've heard it before. The Kane Gang and Deacon Blue songs are nice. I wasn't aware of 'Shattered Glass's existence until the early-mid 00s, or that it was a cover until now. I like it, but it sounds too much like SAW were trying to make a new version of 'Gloria'. It's a shame they didn't give her a new composition to sing, instead of this and recycling a Hazell Dean song. The Jon Astley song was interesting. The silhouetted woman who looks like Janet in the 'Diamonds' video apparently isn't her. I discovered 'Myfanwy' a couple of years ago while skimming through this section of your blog that I've not previously commented on. I liked it, actually; I think partly due to the unusual time signature or syncopation, and downloaded it. Though I haven't listened to it for a few years. It doesn't seem like a very likely top 40 entry in 1987, though. In general, I hate when live performances are used in lieu of a music video, and find it a chore trying to watch 'Didn't We Almost Have It All', even though I liked the studio version. I literally thought this song might have been called "All At Once Part 2" when I first heard it on the radio, as it sounds so similar to that track on her debut. Didn't know the Cure song until buying their 'Galore' 1987-1997 compilation. Pretty sure the T'Pau song passed me by at the time. 'Let's Dance' is a song I liked at the time, but now think it's a bit subpar.